The HID FPISO FlexISO Cards are ISO 7810 compliant with a nominal thickness of 0.03 inches (0.76 mm). 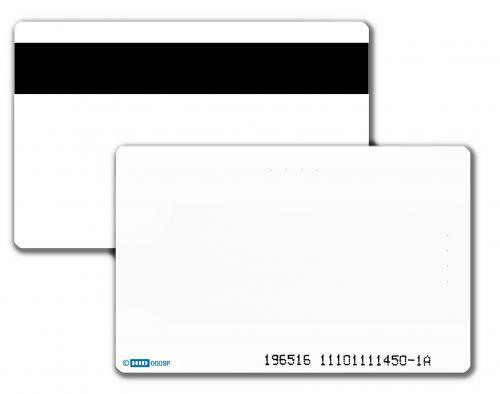 The HID FPISO FlexISO Cards contain multiple ID technologies and optional magnetic stripe in a single credential. You can print directly over the FlexISO's front surface by using your dye-sublimation printer. Barcodes can also be imaged onto the card for systems tracking, time and attendance or job costing. The HID FPISO FlexISO Cards feature FlexSecur technology, which provides an added level of access system security through a verification process at the reader. FlexSecur screens out unauthorized cards prior to sending card data to the host system. Graphics quality Surface on both sides. Optional magnetic stripe for use with other systems, such as cafeteria vending, copy machines and fuel dispensing. Compatible with all Indala readers, and can be easily encoded with Indala's ProxSmith Programmer and toolkit. The passive, no-battery design allows for an infinite number of reads, and is warranted for life against defects in materials and workmanship. PVC card surface is optimized for dye sublimation printing. Can be combined with a magnetic stripe, barcode, a multitude of smart chips, and MIFARE®. Includes sales order number and ID number matching internal ID. Available on FlexISO with customer-supplied artwork.